Io uso la ricetta di Montersino e devo dire che è la migliore che ho provato fin'ora. Mischiate tutti gli ingreidenti, ma non usate tutta la farina, sarebbe troppa e gli gnochi verrebbero duri. Tenetevene un po' per usarla dopo. Fate un bel salame con l'impasto e mettetelo da parte preparandovi laforchetta o un rigagnocchi. Io uso la forchetta mi trovo meglio. 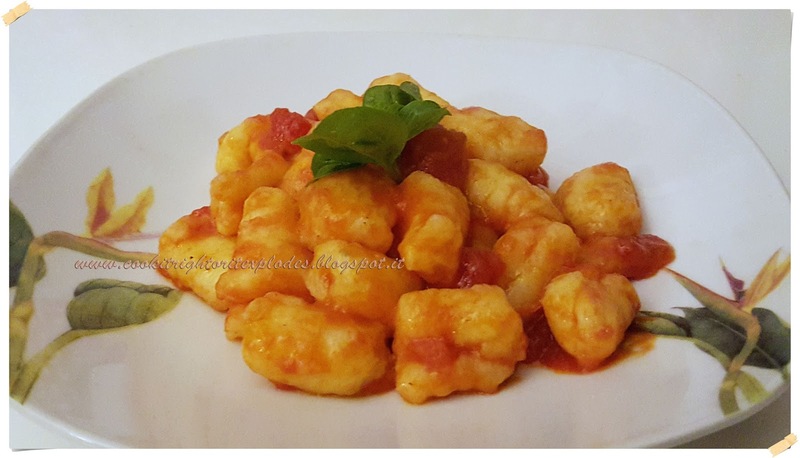 Ora prendete un pezzodi impasto e fate un salametto lungo, tagliate un po' di quadratini e formate gli gnocchi con la forchetta o il rigagnocchi, aiutandovi con un po' di farina che avevate lasciato da parte. Ora non resta che cuocerli e inventarsi un condimento. Io questa volta ho usato un semplice sugo col pomodoro, ma potete sbizzarrirvi. I don't make them all that much even if they're really fast to make and are so delicious! I used Montersino recipe and it's the best one I ever tried until now. Put the potatoes with their skin in a pot with water and cook them untile they're soft. When they'll be cooked use a potato macher (which also will eliminate the skin). 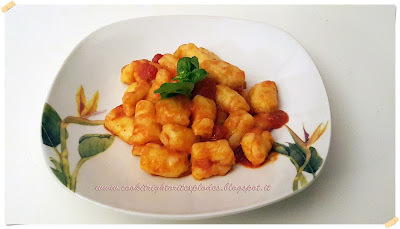 Mix together all the ingredients, but make sure to not use all the flour, if you do the gnocchi will be too hard. You'll need the flour later though. Now make a sausage with the dough and prepare a fork or a rigagnocchi. I'm used to the fork. Take a peace of the dough and form a long sausage with it, cut in squares and using a fork or a rigagnocchi with some of the flour you still have, make the gnocchi form. Now they're ready to be cooked and you can think about a sauce to use with them. I used a simple tomato sauce.